Don't take our word for it! Below you will find reviews from verified customers about Formalicious. A big advantage with this extension, that may not be apparent at first is the implicit organization (of forms and collected data) that naturally occurs in due course. In essence, you have a central place to administer your forms from. I love it. 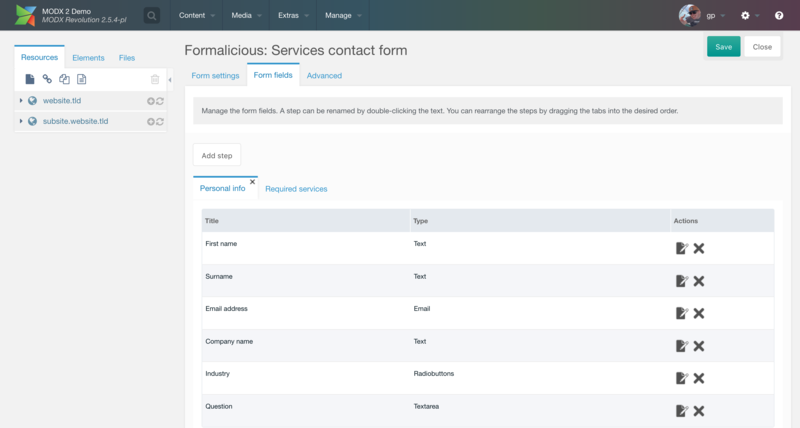 Adding new inputs (form field templates) is very straight forward. One of the first thing I did was add a 'time & date picker' input. Since there's no standard method for doing this, I went and found a nice bootstrap widget, plugged everything in and made a "Form field" template. Everything worked right off the bat. Next, I added the "ajaxupload" extension (available in the modx repository) for fully featured file uploading. This took a little more work, as I needed to add some hooks (pre and post, which Formalicious makes quite easy) for email attachment, etc. to meet my particular needs. Yet again, no sweat! The only thing I'd say could be much better here is the documentation. It's adequate, although it could be greatly expanded. Ultimately, I would definitely recommend this extension! Please Login to your Account to leave a review. *We reserve the right to remove reviews that are: 1) not related to Formalicious, 2) submitted by users that have not purchased or used Formalicious, 3) offensive to our users or 4) otherwise break moral decency rules.